Villa Sea Nymph is situated in the private estate of Montjean. It offers a large living room with a panoramic view on the ocean, Turtle island and Marigot bay. The 3 bedrooms have king-size beds with en suite bathrooms and ocean views. Casa Paraiso is decorated with contemporary, modern and comfortable Italian furnitures, very well equipped with Spa, fitness room, electric gate, infinity pool. The villa is less than 5 min walk from the shops and restaurants. Do not hesitate to contact us if you have any questions about villa Paraiso. Villa MYSTIQUE has breath taking views over the bay of St. Jean. The villa has five spacious bedrooms, each with a private bathroom. The garden is tropical and several birds visit you for breakfast in the morning. The navy blue infinity pool melts in the decor. Villa SUNRISE has breath taking views over the bay of St. Jean. There is a large terrace and one semi-outdoor dining area. The villa has an 'open lifestyle', you live mostly outdoor close to nature. Pure ZEN luxury. 1 br - Outdoor pool - New revised price! Fantastic view over the bay of St Jean and 2 minutes away from the beach, boutiques and restaurants, this apartment is a great opportunity with the pool of the residence and the private parking space. This apartment is a good investment whether you want to make it your own home or rent out on a long term or short term basis. Land for sale in Marigot with ocean view, 950 m2 with a valid 4 bedrooms villa delivered building permit. Two lands for sale in Grand Fond with ocean view, first land is 3485 m2 and the second land is 33060 m2. Feel free to contact us as we have more prestigious properties or lands available that could suit your needs. Land for sale in Colombier - Fantastic view! This new land for sale in Colombier offers a fantastic view of Flamands bay and the ocean. It measures 830 m2 and is buildable with a delivered building permit. Listed price €1,250,000. Please contact us for more information about this land for sale in Colombier. Villa Tourterelles is located above a natural reserve in the very quiet Saline hill. 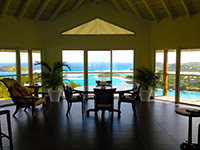 It consists of several traditional St Barths style cases with a large deck and a beautiful view over la Saline. The price is very interesting and still negotiable for a quick sell. Villa les Salamandres is a new villa for sale located in Vitet. This property is surrounded by a verdant tropical garden and has a nice view on Grand Cul de Sac and Tortue island. The whole villa has been renovated and redesigned with a modern kitchen and a large wooden floor living room. Very private and calm, villa Horizon is in the heights of Anse des Cayes and has a spectacular 180° panorama view on the bay and the ocean. This villa is a good investment whether you want to make it your own home or rent out on a long term or short term basis and the price is negotiable. Land for sale in Vitet - Beautiful ocean view - New revised price! Two lands for sale in residential area Vitet, total 2881 m2. Feel free to contact us as we have more prestigious properties or lands available that could suit your needs. Protecting the privacy and confidentiality of information about our clients is very important to Real St Barth. The list of properties posted to our website is not exhaustive. Please feel free to contact us, as we have more prestigious properties for sale or land available that could suit your needs.